The Amateur Radio on the International Space Station (ARISS) packet digipeater system is again operating on VHF — 145.825 MHz. 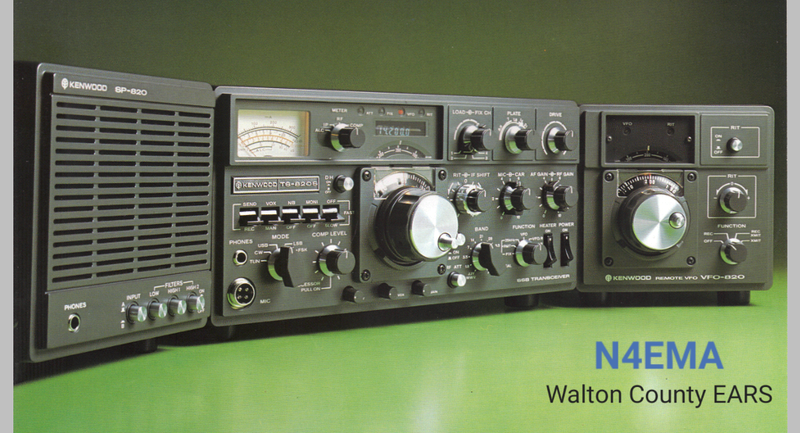 Follow this link to ARRL for the full story. We now have the ability to submit License applications electronically to expedite the process. New and Upgrades could be issued as quick as Friday by 4pm. What can I do with a Ham License? Talk to people in foreign countries. DX’ing is a favorite of many hams! Help in emergencies and natural disasters by providing communications. Provide communications in parades or walkathons and other public service events. Hook your computer to your radio and communicate “computer-to-computer.” Hams use radio modems. Talk to astronauts in space, or use the moon to bounce signals back to people on the Earth. Experiment with Amateur TV (ATV), Slow-Scan TV (SSTV), or send still-frame pictures by facsimile. …and this is only the beginning! You are limited only by your imagination and ingenuity. This is the new DSTAR Repeater Stack for Walton County ARES located at the EOC Operated by Walton County EARS – N4EMA. We hope to have the new N4EMA DStar Repeaters on the air this weekend. There is still lots to do to complete this project. In the end we’ll have a great system to assist our served agencies with EMComm when needed. Special thanks to Jeff Goldburg at the Walton County Emergency Management for securing the grant to fund this system. Special thanks to Sharon Joyce – KJ4TPQ for all the admin work on the gateway, Rebuilding the computer system and rescuing the registrants orphaned by the lightning strike that took out the previous WF4X stack in Freeport. Please bring your laptop. We’ll be setting up 4 mock deployments using the “Go Boxes”. The plan is to setup and run Drats on the ICOM ID-880H and TX into a dummy load. All Hams interested in Emergency Service are encouraged and welcome to join us. If you’re not already licensed but interested in becoming licensed you’re welcome to stop by and check out what we’re up to. The local W5YI-VEC Team has a test session scheduled for 7pm Thursday March 16th at the EOC. That’s 75 S Davis Ln, DeFuniak Springs, FL 32435. We’ll see you there and good luck. Please join D-STAR Info, broadcasting live from George Gwinnett College! The D-STAR panel of experts will be discussing various aspects of the D-STAR System, including updating/programing your radio, different D-STAR devices and more! Click the Pic for the link. The main topic of this months meeting was receiving NOAA weather data using cheap a SDR receiver and the excellent software provided by WXtoImg. Come join us and see what we’re up to next month.